The world has transformed – technology is now everywhere and we use it for more things than ever. Your home is probably filled with different gadgets from computers to smart light bulbs. Electronics are truly everywhere. However, modern electronics are also not meant to last forever. Since technology is constantly improving, there are lots of new innovations on the market. The gadgets you bought a year ago might not be as cool anymore – innovation is hard to keep up with these days. So, you start considering the option to upgrade. But you might not have a fortune to spend on your electronics – if you want to upgrade many products at once, the price can quickly stack up. So, how can you take a dollar-sense approach to upgrading your electronics? The first step is to come up with a budget. The most common reason for overspending is to not have any kind of idea how much you are able to spend. Just swinging it is not a good tactic to use when it comes to upgrading gadgets. So, look at your current budget and see what kind of budget might be reasonable. Take into account any savings you might have and think whether you’d be willing to spend them on electronics. Be realistic and don’t consider taking debt just for product upgrades. Credit payments should really only be an option if your current electronics are broken. Once you are aware of what you might be able to spend, you need to start thinking what you want and what you need to upgrade. If you have a luxury budget, you naturally can just focus on what you want to upgrade. Those working with a tighter budget must focus on the need side first. Electronics older than five years are definitely coming to the end of their life cycle and should be a priority. On the other hand, anything you’ve bought within the last year shouldn’t be a necessity to upgrade right now. Think also about the functionality and use when prioritising your upgrades. Does the product function well? Do you struggle with compatibility issues? You might sometimes find it easier to upgrade an item to ensure you can make more use of it with another new product you’ve added to your gadget collection. For example, perhaps your new laptop is not compatible with your old smart TV and this limits the functionality of both – by upgrading, you ensure more uses for both the phone and the laptop. In addition, you should consider the use. You might have bought an electronic face brush but have never used it. Upgrading it to a new one might not really make sense. 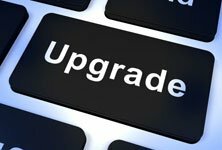 So think carefully which electronic require an update and which you’d like to upgrade. Once you have your list, don’t just walk into the store and buy an upgrade. More specifically, don’t just upgrade your Samsung smart TV to another Samsung smart TV without thinking about it. Especially if your electronics are old, you might find plenty of new products on the market that perform better. So, start researching the market. Read product reviews from popular blogs and websites and check with your friends and family. When you are scouting them market remember to keep in mind these two things: your budget and the compatibility requirements. If you need the product to be compatible with electronics you are not going to upgrade, this is especially crucial. Now, when it comes to buying the products, you should definitely compare the prices with different retailers. Once you find the electronics you want, don’t just walk into a store and buy it – browse online stores and check on the high street to find the best deal. It’s especially important to check online. Retailers often run special discounts online for electronics. It’s also beneficial to consider upgrading during big sales. The Black Friday, Boxing Day Sales and End of Summer Sales are all great occasions to upgrade electronics on a budget. Finally, don’t forget to think what you’ll do with your old electronics. You can’t just dump your products – you need to recycle them to avoid fines and to help the environment. Now, some retailers offer free collection of old electronics as part of the deal. Currys.co.uk has plenty of offers where you can swap items for a small fee. These sometimes cost so remember to calculate the cost to your final budget. If your products are still in good working condition, don’t forget you can donate them to charity or sell them online. You can earn extra towards your budget by selling the products on Ebay or Craigslist. Upgrading electronics is possible with a dollar-sense approach – you just need to know what you want and do your research.